Even in the NorthWest we get some hot days. I know it’s hard to believe, what with the reputation of never ending rainy days and tall evergreen tress but we are at the beginning of 90 degree temperatures like the NorthEast. When the weather warms up like this the boys and I go out in search of water to cool ourselves down. There are a number of great pools in Portland but when it is just me and three kids a pool is a bit bigger than I can handle. So instead of hitting up the pool we find one of the many great fountains around town where a stay at home dad can do better to keep tabs on three toddlers. 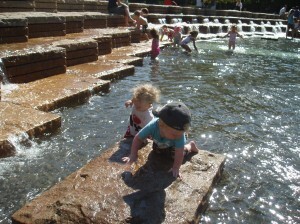 The best of the fountains in Portland is the Jamison Square Fountain in the NW neighborhood called The Pearl. 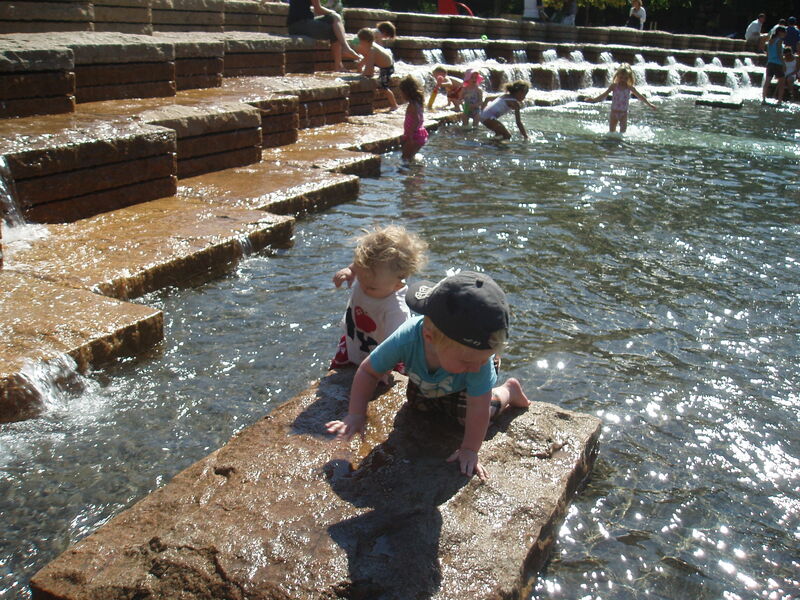 We have been to this one many times letting the boys run through the large pool of water and climb the stone slabs where the water trickles out. The pool fills and then drains every ten to fifteen minutes. The moms there seem to think I need extra help because there is no shortage of advice for me on how to deal with the boys. I take it and smile, I know they mean well. The boys love to run in and out of the water in ever growing circles. Next to our house is Overlook Park and on Wednesdays in the summer there is a Farmer’s Market in the park and the small fountain is turned on during the market. It is a great place to grab some produce and baked goods while the boys run through the streams of water with the other neighborhood kids. There are usually one or two parents on our block trading off kid watching duties while the other parents grab their pallets of strawberries and fill a growler of Organic beer. Though this is a small fountain having their friends from the block makes this a favorite as well. Waterfront park along the Willamette river has the mother of all fountains that the kids love to play in but is often so packed that it’s not that fun for dad. The Bill Naito Legacy Fountain is in such a beautiful location and should be part of any visit to Portland for people with kids. There are sure to be plenty of kids to play with on warm days. Portland Dad writes over at Stay At Home Dad PDX about raising two boys as a stay at home dad. You can also find him on twitter as Portlanddad.